In Cleveland, Kyrie Irving has been a shot making maven. In Oakland, he was an off-the-dribble disaster. He missed a whole bunch of shots and most of them were off-the-dribble. Last week, Zach Lowe talked in podcast Kyries struggles off the dribble. To this point in the playoffs, 52 percent of Irving’s shots were off-the-dribble jump-shots compared to only 13 percent catch-and-shoot jump-shots , according to NBA.com. Kyrie loves shooting off-the-dribble but should he? During the playoffs, Irving has shot 45 percent on shots off the dribble while shooting 49 percent on catch-and-shoot opportunities , according to NBA.com. On three-point-shots the difference is staggering. Irving has shot 53 percent on catch-and-shoot opportunities while shooting only 37 percent off-the-dribble. Nylon calculus even did a piece on the difference between how players shoot off-the-dribble and catch-and-shoot and Irving’s shot varied more than almost any other player. Clearly Kyrie needs to adjust his shot distribution. Alec Burks has a similar problem. He dribbles and dribbles and dribbles and shoots but he’s much better when someone is passing him the ball. Only 15 percent of Burks shots were catch-and-shoot opportunities, while shooting 40 percent of his shots came off-of-dribble. This season, he shot 39 percent on catch-and-shoot opportunities and 35 percent off-the-dribble. This isn’t a new trend either. Last season he shot 43 percent on catch-and-shoot opportunities and 36 percent off-the-dribble. Burks, and by extension the Jazz, are better when Burks takes his shots off of another players dribble. Besides, both Hood and Hayward are better passers than Burks. Anything we can do to keep these two facilitating the offense is a good idea and that includes keeping Burks from dribbling. Much like Irving, Alec Burks needs to learn how to play off the ball. Gordon Hayward is the leading scorer on the Jazz and is probably the best player on this Jazz team. Dante Exum is our mysterious number five pick and many would say he has the best chance of becoming a superstar of anyone currently on the roster. Hayward is a surprisingly average shooter. Exum’s shooting is even more underwhelming. And it doesn’t seem likely that either’s shot will change too dramatically. Hayward is approaching his seventh season. He will probably reach the peak of his developmental progress soon. He’s a career 36 percent shooter from behind the arc if you include his rookie year when he shot 47 percent from deep. Maybe Hayward improves his shooting but he’s never going to be a Klay Thompson or even J.J. Redick type shooter. Exum, on the other hand, is nearly 21 and is preparing for only his second season of NBA play. He’s young, inexperienced and as raw as frozen sushi. I am optimistic that Exum’s development will go well and I think that Quin Snyder is the perfect coach to do it, but I can’t imagine a reality where he’ll become an elite shooter. Exum shot 31 percent from three in his rookie year and almost all of those shots were wide open. Maybe a Kawhiesque shot transformation is in Dante’s future but probably not. Can Players be elite even if they don’t have an elite three-point shot? We all know that three-point shooting is invaluable in the NBA and maybe it seems like our players can’t develop into stars without a killer three-point shot but is that really the case? Admittedly, most of the best players and especially guards and wings can shoot threes. Kawhi is great, Durrant is great and Steph is straight unbelievable but not all stars are great three-point shooters. Perhaps no aspect of Lebron’s game has been more criticized than his three-point shot. Throughout his career, Lebron has shot a mediocre 34 percent from three-point range and this year shot worse than Exum. Lebron is perhaps the most dominant player of our generation and he’s shot poorly behind the arc more often than he has shot well. Lebron relies on his phenomenal athleticism and strength and is basketball savant. Westbrook is a freak athlete who gets to the basket at will. He’ll outrun and outwork anyone, he is a devastating one-man fast break and a triple-double machine. When Durant went down last season Westbrook became a serious MVP contender. Westbrook can certainly get hot behind the line but the numbers say he’s borderline bad at shooting. During the regular season, Westbrook shot just under 30 percent from three and his career average is just over 30 percent. DeRozen is not quite the star that Lebron or Westbrook are but he was an All-Star this season and his team made it to the Eastern Conference Finals. He’s long, a good athlete and a skilled basketball player but his jump shot leaves something to be desired. He shot a career-high 34 percent from three this year and is a career 28 percent three-point shooter. I would argue that Hayward is already a better player than DeRozen and he’s unobjectively a better shooter. It’s no secret that John Wall is not a good shooter but he is a three-time All-Star and is still widely considered the alpha dog on his team, even though Bradley Beal is becoming a star as well. Wall is one of the few players who could rival Westbrook in a footrace as well as one of the longest point guards in the league. He’s also a phenomenal passer and is becoming a great mid-range shooter. This year Wall shot 35 percent from three and is a career 32 percent three-point shooter. Fun Fact: Did you know that John Wall’s full name is Johnathon Hildred Wall? Parker is a four-time NBA champion and won the finals MVP in 2007. He is known for being one of the quickest players in league and has an incredible feel for getting to the hoop and making mid-range shots. The last couple years Parker has been quite good from deep but he is only a 32 percent three-point shooter and has had some of his most productive NBA seasons during some of his worst three-point shooting years. Hopefully, Hayward will become a better shooter and Dante almost certainly will, but I think we’re living in a fantasy land if we believe either will ever shoot above 40 percent from three in a season. I hope they prove me wrong but I don’t see it happening. Maybe Exum Develops into a star and maybe Hayward becomes a better star but they don’t have to be elite shooters be great. Posted on June 3, 2016 June 4, 2016 Categories Utah JazzTags Basketball, Dante Exum, Gordon Hayward, John Wall, Lebron James, Russell Westbrook, Shooting, Tony Parker, Utah JazzLeave a comment on Do Gordon Hayward and Dante Exum have to become elite shooters to become elite players? It’s no secret that the Jazz have let some premiere players go in the last several seasons. Whether it was Paul Millsap becoming a near All-Nba player or Wes Matthews developing into an All-star, nearly everyone the Jazz let go seemed to go on to have more success on their next team. So let’s go back in time change the Jazz destiny and find out why these players didn’t work out and what the team would look like today if we had kept some of the standouts we let go? Matthews was exactly what a team hopes for when they pick up an undrafted free-agent. When he debuted for the Jazz he was both an above average shooter and defender as a rookie and started 48 games. The Jazz thought they had struck gold until Portland seemingly overpaid Wes Matthews by him offering him a poison-pill contract that Utah refused to match. Matthews true shooting percentage has always been quite good but with increased usage, he really flourished in Portland becoming a go-to three-point shooter. Despite a season-ending injury last season he had a solid season with Dallas this year. Kyle Korver was one of the few free agents brought in during the Deron Williams era. Korver was always a great three-point shooter but was kept on the bench because of his anemic defense. After only three seasons in Utah Korver’s dead eye was no longer enough to keep him around and he was signed by Chicago. Since Korver has been in Atlanta he has been given the green light when it comes to shooting and he has thrived. In 2015, he logged a true shooting percentage of .699! Stephen Curry had a career-high true shooting percentage of .669 this year. Even Korver’s defense has been passable as Atlanta has been, on average, eighth in defensive efficiency over past three years, according to espn.com. In 2011, the Junkyard Dog signed in Utah and quickly became our best wing defender and a needed source of energy for the Jazz. After only a year and a half in Utah, the Jazz decided to move on from Carroll and let him sign with Atlanta. This opened up a starting role for Gordon Hayward and has probably allowed him to develop into an All-Star-caliber player. Carroll soon became one of the league’s premiere wing defenders and an above average three-point shooter. Millsap always seemed to give us more than we expected from the time we drafted him up until his final year in Utah. He was a tough worker who consistently got the most out of his seemingly small and unathletic body. In 2013, the Jazz let go of Millsap and he signed with the Atlanta Hawks. The move was to free up playing time for the younger, and supposedly more talented, Derrick Favors and Enes Kanter. Millsap was criminally misused while in Utah and understandably we thought he may never be an elite defender. The Draymond Green small-ball era hadn’t begun and we were still reeling from the memory of another undersized power forward’s poor defense. I’m looking at you, Carlos Boozer. In the year he went from Utah to Atlanta his usage rate went from 22.4 to 25.7 and his three-point rate nearly tripled according to basketball-reference.com. This means not only has he been used more in Atlanta but he’s been used more efficiently. Williams was drafted by the Jazz but played for the team again in the 2011-2012 season. Williams was always a good but not great player for the Jazz. He was an above average shooter and a streaky shooter who could really catch fire. He scored 52 against the Pacers in 2015. Since he left the Jazz Williams hasn’t really been a world beater but has remained a good shooter and up until this year has been better than any of the point guards on the Jazz. Would the Jazz have been able to afford all of these players? Probably not without them taking significant discounts or the Jazz going well into the luxury-tax. For this year the salary cap was $67,000 and the Jazz were about 2,000 dollars below the salary cap. If they had kept a couple of these players they would have had to clear some cap space along the way. If we just kept Hayward, Favors, Gobert and Hood from the current roster we would be on the books for almost $30,000 this year. The cap is about $67,000 leaving us with about 37,000 in cap space. If we assume that Carroll, Korver, Matthews, Millsap and Williams would all have similar deals to the ones they are currently on they would demand about $57,000. If we took away Millsap’s salary or Williams and Matthews we would have enough money and perhaps go into the luxury tax to fill out the roster. I won’t go in to too much detail about the Jazz salary-cap sittuation but a few weeks ago SLC dunk wrote a detailed break-down of the the subject. What would the team look like? I am assuming that we are keeping Favors and Hayward because Hayward was on the roster before any of these players were released and just keeping Matthews probably wouldn’t have prevented the Deron Williams trade. Gobert and Hood were both drafted late in the first round so I am assuming that we would have picked them with our first-round picks instead of picking Burke and Exum. If to keep chose to keep the Millsap group our roster would be quite a bit different. We would have quite a small-ball lineup with Millsap, Hayward, Carroll, Korver and Favors or we could go big with Gobert, Favors and Millsap with Korver and Hayward. In this scenario, we wouldn’t really have a point guard and Rodney would probably come off the bench but our shooting and defense would be incredible. One problem our the current Jazz roster has is that there are not enough players who are proficient at spot up shooting. If I were the Jazz I would let Hayward and Millsap be facilitators and not worry about not having a true point guard. If we chose the Matthews group we could have an incredible three wing team with Matthews, Hayward and Hood/Carroll, Gobert and Favors with Williams coming off the bench. We could also have Williams start and have either Matthews or Hood as our sixth man. One of our biggest problems this year was our wing depth which wouldn’t be close to a problem for this theoretical team. The interesting thing about these teams is that we would still have problems at the point guard position. The Jazz haven’t really had an opportunity to get or keep an elite point guard since we traded number 8 to Brooklyn. One drawback to these scenarios is we probably wouldn’t have Lyles or Exum who both seem to have bright futures ahead and who knows if we still would have hired Dennis Lindsey who then hired Quin Snyder. Although it is interesting to think about what could have been I think the Jazz have made more good decisions than bad ones. This has been especially true since Dennis Lindsey got here. Maybe keeping a player or two along the way would have been a good idea but maybe it would have warped the space-time continuum and created a temporal paradox. Posted on May 27, 2016 June 1, 2016 Categories UncategorizedTags Demarre Carroll, Free agency, Kyle Korver, Mo Williams, Paul Millsap, Utah Jazz, Wesley MatthewsLeave a comment on Utah Jazz All What-If Team. 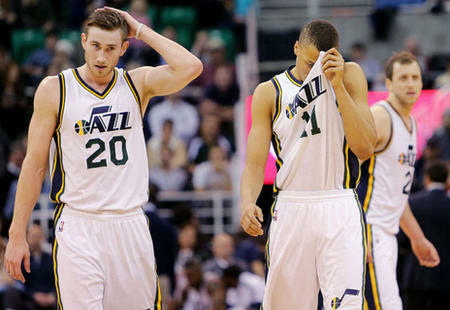 How does Gordon Hayward measure up to historic Utah Jazz Small Forwards? Perhaps there hasn’t been a recent player more polarizing in Utah Jazz fan circles than Gordon Hayward. A borderline All-Star/ number one option who has a penchant for inconsistency yet is constantly improving. Regardless of how one feels about the Vanilla Villain, there’s no denying that he is a pretty proficient NBA player. With a shallow pool of small forwards in Jazz history, one has to wonder how Hayward measures up. 1. Shooting: Does he put the ball through the net from deep? Does he take smart shots? 2. Defense: How well does he stop the other player from scoring? Does he block shots, steal the ball and is he a good team defender? 3. Passing: How well does he find other players? Can he get the ball to h is teammates when they get open? 4. Scoring: How well does he score points? Is he consistent and reliable? 5. Intangibles: Is he a good teammate? Does he make other players better? Does he have a high give a crap factor? In other words does he care about his teammates and winning enough to constantly play hard? 1. Dantley had a silky smooth mid-range game but rarely shot threes and shot a low percentage on those he did. Dantley Ranks our number three shooter. 2. Dantley was solid at best defensively and was never a shot blocker or a ball thief. Dantley ranks as the number five defender. 3. Dantley had the ball in his hands constantly and just by opportunity racked up a few assists. He is our number four passer. 5. Never really a fungus in the locker room but a sub-par leader who rarely made his teammates better Dantley ranks fifth in intangibles. 1. A solid shooter from the outside with limited opportunity. Russell is our number two shooter. 2. The player tasked with guarding arguably the best scorer or all time, in the finals, and did a fine job of it despite the outcome. Russell is our number two defender. 3. Russell had the ball in his hands very little and those rare passes he did make never really amazed. Russell is our number five passer. 4. See number three and two. Russell is the number five scorer. 5. A hard worker and decent teammate who rarely let the other teams talk get to him. Russell is number two in intangibles. 1. Harpring was a great mid-range shooter but never really shot the three-pointer well (33 percent) or often. 2. A solid defender but never agile, big or athletic enough to constantly win battles defensively with the league’s elite. 3. Not really known for his passing but a willing passer Harpring is ranked number three in passing. 4. One of the more consistent off the bench scorers I have seen and prolific scorer in his time starting. Harpring is ranked third in the scoring category..
5. Tough as a rhino’s hide Harpring played through injury and fatigue and was an incredible locker room presence. Harpring is the number one intangibles small forward in Utah Jazz history. Though he improved as a shooter under the tutelage of Jeff Hornacek, shooting was never AK-47’s forte. It never really became comfortable to watch him shoot. On a list filled with shooters, Kirilenko comes in a number five. A jack of all trades, long as it gets and quicker than lightning sand. Kirilenko had the unteachables to be an all-time-great defender. Incredibly he lived up to the hype playing elite defensively both on and off the ball. Kirilenko is our number one defender. With a relatively high basketball IQ and more than a few pretty passes, remember his between the legs pass to Matthews against the Grizzlies? This eccentric haired Russian was a phenomenal passer? Kirilenko ranks second in passing. Kirilenko worked well with almost any line-up Jerry Sloan jammed him into. He played a couple different positions and was willing to guard every position at one time or another. There was the crying about the minutes debacle, so we’ll rank Andrei number three in intangibles. 1. Hayward shoots a better percentage and more often than anyone else on this list. Hayward is our number one shooter and it’s not even close. 2. A great team defender who usually guards the other team’s best scorer. He is just long enough and quick enough to be fringe elite on the defensive side of the ball. Hayward is our number three defender. 3. Probably the best passing small forward in the league this side of Lebron, a great Hockey assister and a decision maker. Hayward is our number one passer. 4. Between his ability to drive to the hoop, get fouled and shooting ability Hayward is an elite level scorer who needs just a tad more consistency. Hayward is the number two scorer. 5. A coach on the court, leader by example and learned vocal leader, Haywards intangibles are superb. Hayward is the second ranked player as far as intangibles. After going over the different skills of Jazz small forwards, I am pleasantly surprised to find that G-time compares favorable to the greats at his position. He’s already the best in many ways and he is still getting better. We are all lucky to watch him play. Posted on February 20, 2016 February 28, 2016 Categories Utah JazzTags Adrian Dantley, Andrei Kirilenko, Bryon Russell, Gordon Hayward, Matt Harpring, Small ForwardLeave a comment on How does Gordon Hayward measure up to historic Utah Jazz Small Forwards? Who makes the Utah Jazz final roster cuts? Before the beginning of the NBA season the Utah Jazz will thin their roster down to 15 many of the rotational positions are filled but the Jazz will be looking to trim the rest of their down to just a few players. Gobert, Pleiss, Favors, Booker, Lyles, Hayward, Hood, Burks, Burke, Exum, Ingles and Neto all have guaranteed and or have multi-year deals and are therefore pretty likely to be with the team when the season starts so we’ll leave them out of the discussion. Brock Motum: The Aussie Center has decent Traditional Center ability and can even shoot a little from Behind the arc. Jack Cooley: A grit and grind type of player who always seems to work his way into rebounds and shots you would never expect him to get but somehow he out works the other player. Grant Jerrett: One of the oft overlooked assets from the Enes Kanter trade. He probably the greatest stretch four potential of any of the players on the bubble. J.J. O’brien: A rookie who showed out well in summer league. One of if not the best defenders on the Jazz summer league roster and shot well from the field and behind the arc in limited attempts. Chris Johnson: Was on the team last year, maybe the best balance of offense and defense we have. Elijah Millsap: An elite defender, hasn’t quite figured out how to play offensively in the NBA yet. If the team thinks he can become an average offensive player in the NBA he will likely make the team. Bryce Cotton: Was signed by the Jazz late last season. Is a small 6’1″ but is an explosive athlete and incredibly quick. Played very well in summer league where he was able to get to the basket almost at will while shooting a decent 6-17 from behind the arc. Olivier Hanlan: Selected with the first of our two second round draft picks. Was an explosive scorer at Boston college but shot poorly for most of summer league. Is likely fifth on our list of PG’s. The players mentioned above take up twelve spots leaving 3 three spots open. I really like Bryce Cotton and even though he would be our fourth point guard I think he deserves a shot at, at least the third point guard spot if not the back spot. Chris Johnson and J.J. O’brien seem to bring similar skill sets to the table so I think only one of them will make the team. The third player I would pick because he’s the best wing defender we have and he brings a toughness and work ethic to the locker room that we need. So why did I leave out all the big men? With the additions of Pleiss (7’3″) and Lyles (6’10”) to our already tall front line the Jazz already have plenty of size in a what is becoming a small-ball league. The more guards we have the versatile we will be. We also have a few wings in Hayward and Hood that could play the four spot in a pinch. Nobody quite knows who will be included on the Jazz opening day roster but the Jazz certainly have some intriguing prospect to mull over. Posted on July 22, 2015 Categories UncategorizedLeave a comment on Who makes the Utah Jazz final roster cuts?